Spring has sprung and ice cream is on your mind. In my case, it never leaves but it is more on my mind after Easter. Although July is national ice cream month, May usually marks the beginning of ice cream season for most, especially once Memorial Day hits. Jeni’s is a default community favorite and while they may be out of the picture for a brief interlude, the brand is still relatively new. We have other great places to try in town and I do have my favorite flavors and spots but there is also my go to ice cream when time is short and cash is crunched. While United Dairy Farmers means convenience stores to many, to me, it has always meant great ice cream. And in my humble and somewhat well-trained opinion, it is an exceptional ice cream, especially their Homemade Brand. I can’t say for certain what the first ice cream was that I had, but I can say the first I remember having is UDF and from when I was three to at least ten years old that would have been either chocolate chip or rainbow sherbet. As my tongue became more attuned to finer ice creams, Homemade Brand has remained a favorite of mine. In particular, Coconut Almond Chip. In the pint or by the cone (I now live a 2 minute walk from a UDF) this is the best value ice cream I have ever enjoyed and I consider it one of the best ice creams I have ever tried (- having sampled in 40 states, 12 countries and countless flavors). One of my best memories and maybe my first food adventure occurred at the UDF plant in the mid 1990’s. I had planned an overnight trip to Cincinnati to visit all of the places I have heard of or read about (including the then exotic Skyline Chili) with the highlight being a tour of the UDF Ice cream and dairy plant in Norwood, Ohio. On the day of the tour, a scheduled group did not show up so it was just me and my companion with one tour guide for a very personal and detailed tour of the whole operation. The guide was overjoyed because he did not have to use a megaphone, he could just have a personal conversation with two people for the tour. We learned about how milk was processed and handled and watched ice cream being made. We sampled a lot of products. It was a really amazing tour. At the end, I received two place mats intended for kids (one showing how milk is made and the other how ice cream is made). I loved them so I had them both framed. It was a great day and that framed bit of dairy art is still a reminder that I cherish. So yes, I am still a big UDF fan. That being the case, I am happy to share that May 8th is the 75th anniversary of United Dairy Farmers. To celebrate 75 years of serving many Ohio communities, all 182 UDF locations will offer 75¢ single-dip ice cream cones on Friday, May 8. That my friend is a good deal. Also, UDF will offer a Stock the Ice Box sale, where customers can purchase five 48 oz. UDF ice creams for $15 – also an exceptional deal. 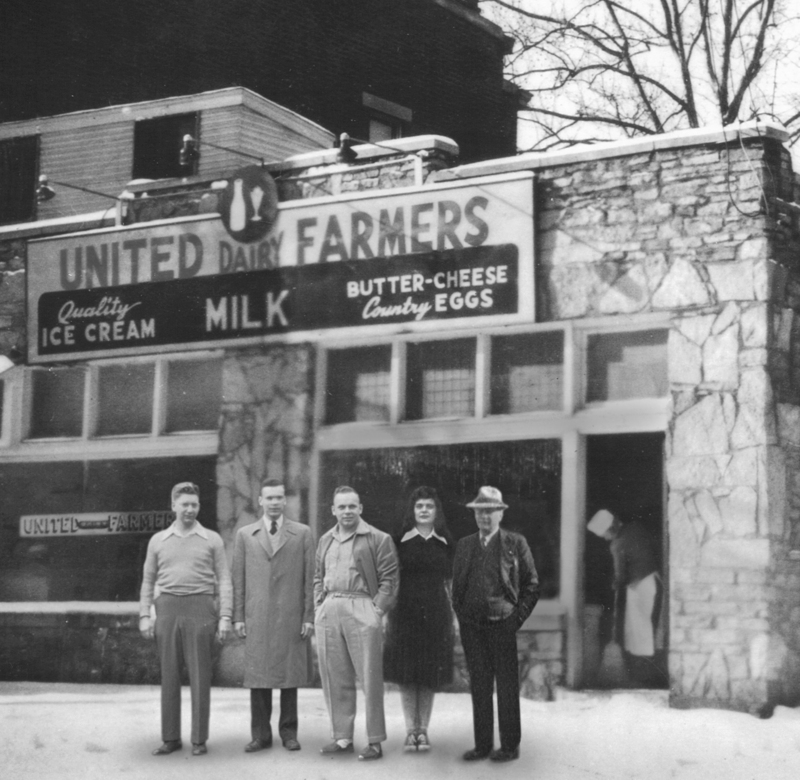 The history of UDF is pretty amazing, but since I may be the only person interested in that I will just leave you with this -> LINK and this bit of trivia: when the first store opened in 1940, they offered a gallon of milk for 28 cents and a triple-dip ice cream cone for 17 cents. UDF is always a good choice for ice cream and on May 8th, it will be an incredible value as well. This entry was posted on May 1, 2015 at 6:28 PM	and is filed under ice cream, Ohio. Tagged: UDF, United Dairy Farmers. You can follow any responses to this entry through the RSS 2.0 feed. You can leave a response, or trackback from your own site. I like the ice cream at UDF but I have stopped getting it. Over the past few years all I see are disinterested employees who roll their eyes when you step to the ice cream counter. When you finally get waited on, it’s a tiny scoop not worth the price. It’s too bad because I do have fond memories of it as well. You can always get a pint still, the best value for quality in the business. And Kroger carries them too. My spouse has mentioned UDF’s cherry cordial and peach ice cream are pretty good; it’s a definite to do in this year’s ice cream explorations.